As a lot of you know, I don’t read a lot of contemporary novels. Often I find the real world boring or quite cliche so I prefer reading fantasy or sci-fi. However there are good contemporaries out there and I’m going to reviews. Some of these I read a while ago but hush let’s pretend I didn’t. The books I’m going to be reviewing today are: Holding Up the Universe by Jennifer Niven and Simon vs the Homo Sapiens Agenda by Becky Albertalli. I was originally planning to add in another book but this post is turning out to be longer than I expected. I basically only read this book because my sister borrowed it from a friend and it was in the house. Plus I loved the cover and found Jack’s condition really interesting and wanted to see how it would play out. Libby was America’s Fattest Teen for a while and she feels like people don’t know her for her. She is going back to high school as a new her and is looking forward to making friends and having fun. Jack is very good at fitting in at high school, he hangs with his friends and jokes around. But he’s actually unable to recognize faces which makes things kind of difficult. The two meet and drama ensues. I really enjoyed this book. I don’t read much contemporary but I loved the cover of this and I thought that the idea of Jack’s condition, prosopagnosia, the inability to recognize faces, was something that would be interesting to read. Beware, the blurb does tend to over stereotype this book and it was actually pretty unique considering how typical a lot of tropes are in YA. I consumed this book so quickly, and I didn’t really care about the presence of a few cliches and unexplained plot points but I felt like the end was too quick and rushed. Maybe I am just too used to fantasy series that draw out the story for ages. As much as I liked Libby’s character I did find her a bit annoying sometimes. She was very self righteous, and some of the choices she made were questionable. And she seemed SO much more self reflective than teenagers actually are. Like she was making points about life lessons and stuff which yes is good to speak about in books but having Libby be aware she was making a life lessons and basically doing things thinking “oh yeah I will teach these kids to be better people” felt a bit fake to me. The romance was a bit unbelievable. I did like that they got to know each other and how their feelings for each other started but it was so melodramatic and that was unnecessary. Why can’t they just be happy together?? And towards the end it got very “yes we are in love forever” vibe but they hadn’t known each other for that long?? so?? I just really liked Jack. Seeing how he dealt with his condition was what first drew me into this series so seeing how that played out was great. There were so many laughable moments in this book and I really appreciated it. It was overall an adorable read. As I said in my “first thoughts” section (which is basically just my goodreads review from as soon as I have finished the book in case any of you are confused) she was a bit annoying sometimes. The idea of her character was good but in reality it got a bit self righteous. She was just so sure that what she was doing was making the world better. She really didn’t act like a teenager. She was far too aware of how her actions would affect others and herself to be realistic (in my eyes) because teens don’t do that all the time. Teens are a mess 90% of the time, we’re focused on keeping our own lives together not teaching others valuable life lessons. Jack was my fav, but I kind of feel like he had limited character development? Like Libby was bold and brave and bubbly but Jack was just kind of funny and nice which don’t really count as traits. Everyone should have the ability to be funny and nice. I really wanted more from him. I was kind of confused about his social position, sometimes to book makes it seem like he’s this really popular kid that everyone likes but the majority of the time he doesn’t speak to anyone or seem to have many friends. I feel like Jack should have been a larger focus of this book, but Libby kind of took center stage. If you haven’t at least heard of this book then you must have been living in Antarctica for a few years. It’s massive in the book community and it did not disappoint. I loved this book and read it in under 12 hours??? Whatttt???? That is so fast for me. I stayed up late into the night to finish this book and it just kept driving forwards. Simon is your typical high school kid, only he’s gay and hasn’t told anyone yet. The only person who knows is his online friend Blue who is also gay. Simon knows Blue goes to his school but doesn’t know his identity, although he does have his suspicions. All this changes when Martin finds out and uses that information to blackmail Simon in the hopes of hooking up with Simon’s friend Abby. And it’s not only Simon who’s at risk, so is Blue’s identity. I knew I was going to love this book, and I was not disappointed. It was nice to read a story that felt so real, and be reminded that not all stories are about overcoming some giant evil villain. The characters were amazing and so well developed. The interactions between them were realistic and I feel like the book was a good portrayal of high school. I especially liked all the friendships in this book. Yes it’s about relationships, but the friendships are kind of a bigger deal? I also loved Simon’s family, they were amazing and adorable and I wish my family was like that. I feel like there is more to the story with some of these characters e.g. Nora and Leah so hopefully some of the authors other books will touch on them? I know The Upside of Unrequited has some cross over characters (speaking of which those titles are awesome). I loved how funny and clever this book was. Blue was so intellectual and I loved it. The only thing that let me down a bit about this story was the writing sometimes felt a bit choppy, especially at the beginning of the book there were a lot of quick scene changes that left me a bit confused. Also the emails between Simon and Blue sometimes picked up at points where I had no idea what was going on which was a bit confusing. And there was this one character, Garrett I think his name was, who was there but never got a personality, and whenever his name came up I was confused for ages. I feel like the writing was the least strong element of this book, not to say it was weak, just that the plot and characters were amazing and sometimes the writing was a bit awkward. I was often confused when there were scene changes and I feel like a bit more detail could be given. I liked the element of the emails between Simon and Blue, it was good to see their relationship develop and get an insight into Blue’s personality. This book was super fast paced which I loved. Trying to figure out Blue’s identity kept me hooked and I am super glad about who it turned out to be. I liked how the book kept going after the big reveal so we could see them together for a while. I also like what happened with Martin. His actions weren’t treated like a joke and I feel like he got fair treatment for what he had done. I can’t really say much more without spoilers so let’s just leave it at that. The characters were where this book really shone. Simon was so funny and I grew to love him pretty quickly. I also loved the dynamic between him and his friends. Leah was so complex!! I loved her, she reminded me of one of my friends. Her reactions to things were pretty genuine and good and I feel like she was a really realistic character. Abby was also really cool. I loved how bubbly and nice she was, but she didn’t take crap from anyone. That is what I aspire to be like. I loved the family dynamic. Nora was awesome and I loved seeing the interactions between the siblings, but I kind of wish there had been more of it. The parents were really good too. They were present and involved (which is a step up from most YA) and they had personality. They weren’t those “cool” parents who didn’t care, they did care and it was great. have you read these books? did you think Libby was a bit overbearing or was that just me? and who was your favorite characters in Simon vs?? That’s so true! It was a lot more fast paced than I was expecting. I have heard quite A LOT about Holding up the Universe. And although the book doesn’t seem to attract me AT ALL, I wanna know what the buzz is all about. 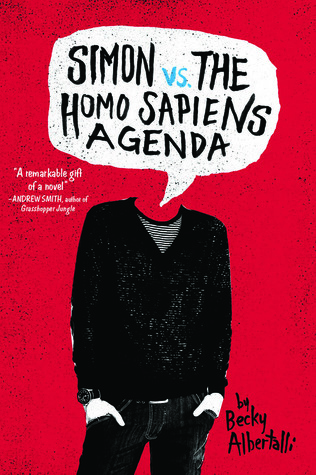 Haven’t read Simon vs. Homo Sapiens either. I want to though. It sounds interesting enough. Awwww thanks!! I am kind of obsessed with how my blog looks and it has taken me a year and a half to be happy with how it looks so that means a lot. I had heard a lot about All The Bright Places, which is by the same author as Holding up the Universe, but it didn’t really interest me so I thought I might as well check out the other one which did. Yeah I loved how funny it was. It filled me with such happy feelings which was amazing. Simon’s a good book. I highly recommend its reading. 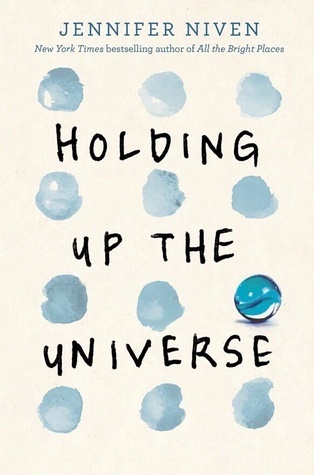 I agree with your review of Holding Up The Universe quite a bit (tho I gave it 2 stars) I do agree about the characters developments being quite limited and while Libby was awesome, I couldn’t connect to either! I really liked the messages of this book and all the dancing and it was really interesting to read about Propagnosia. Other than that, i find the book to be really unrealistic and a fluffy contemporary (which i am not a fan of) I’m glad you enjoyed it though! I don’t usually enjoy fluffy contemporaries either but I had just read a few heavy fantasies so it was good to have something lighter. I’m SO with you on Holding Up the Universe! I adored Jack and I find face-blindness a really fascinating condition because my mum and I both struggle to recognise faces out of context (we’re not at the level Jack is though) so it was cool to see it explored in fullness in a book!! But Libby..gah. She was so self-righteous. I always take issue with characters who’s #1 goal is to make “other people better”…like no. Work on yourself. Fixing other people never ends well and it can be so easily problematic. Plus I found her a bit hypocritical when she told the other fat girl in the school to tell the principal about being bullied but LIBBY WOULDN’T DO IT FOR HERSELF. (I’m still confused as to why she wrote the horrible things about herself in the mirror too?!) Anyway.😂 I loved your review! Yeah one of my school teachers said she struggled to recognise faces out of context as an explanation for why it took her so long to tell us students apart by factors other than where we were sitting. Holding Up the Universe did a really good job of showing me what that would be like and had some scenarios and problems I never would have considered.